Mauch Chunk, a borough and the capital of Carbon co., Pennsylvania, on the "W. bank of the Lehigh river, at its passage through the Mahoning mountain, on both sides of the mouth of Mauch Chunk creek, 46 m. above the entrance of the Lehigh into Delaware river, and on the Lehigh canal and the Lehigh Valley railroad and the Central railroad of New Jersey, 89 m. by railroad N. N. W. of Philadelphia, and 121 m. W. of New York; pop. in 1870, 3,841. It is built chiefly in the valley of the creek, on a single street, between the Mahoning and Sharp mountains, in so contracted a place that little room is afforded for gardens to the houses. The hills on each side rise precipitously to the height of several hundred feet, and not far back attain an elevation of more than 1,000 ft. above the river. The place derives its importance from the mines of anthracite found in the Sharp mountain at this eastern extremity of the southern anthracite field of Pennsylvania. The mines of Summit hill or Sharp mountain, 9 m. W. of the village, up the valley of Mauch Chunk creek, have been famous as among the oldest known and most productive of the coal mines in the state. One bed more than 50 ft. thick has been worked over many acres. The coal from these mines was formerly taken to Mauch Chunk over the famous "Switchback "gravity railroad, and thence transferred by chutes to the Lehigh canal. The cars run by gravity the whole distance to Mauch Chunk, and were formerly drawn back by mules, which jnade the descent in cars provided for them. But a return track is now laid, along which the cars descend from the chutes at the canal to the foot of Mt. 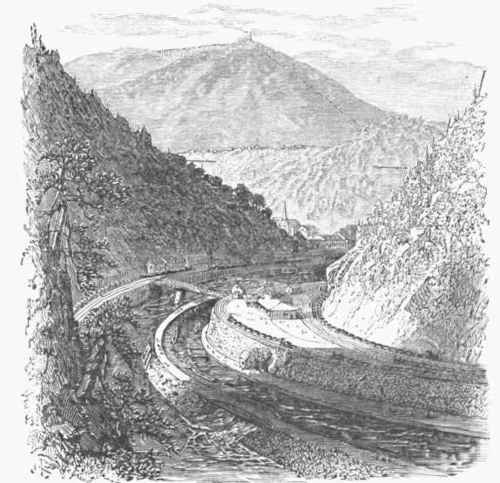 Pisgah, the high point of Sharp mountain next the river, and are then raised to its summit up an inclined plane by a stationary steam engine. From this point they then run 6 m. by gravity to the foot of another inclined plane, up which they are raised as before, and from its summit descend to the different mines. This road has been superseded by a tunnel at Nesquehoning, and it is now only used for pleasure excursions. The Lehigh canal, with the slackwater navigation of the Lehigh, was formerly continued 25 m. further up the river to Whiteshaven, but having been destroyed by a flood it is now abandoned above Mauch Chunk. The coal mines and furnaces in the vicinity and the Lehigh Valley railroad are controlled largely by residents of the borough. It contains several handsome houses, a fine public school house, court house, jail, two founderies and machine shops, a flour mill, two national banks, a private bank, two weekly newspapers, a library, and five churches. The beauty of the scenery, the coolness and purity of the air, and the excellence of the water have rendered it a famous summer resort. Glen Onoko, near the borough, a wild and beautiful ravine, is a prominent attraction. The borough limits being circumscribed, the population has extended to Upper Mauch Chunk, on a plateau above the town, and to East Mauch Chunk, a borough on the E. bank of the Lehigh, having 1,585 inhabitants in 1870. The population of the township of Mauch Chunk, on both banks of the river, exclusive of the boroughs, was 5,210. The name is of Indian origin, and its meaning is said to be Great Bear.